Cards and Cooking Corner: Shades of purple. I am up with a simple card, I have used the new release from Uniko - Originally Organics here. I stamped in blue ink, and colored using the zigs. 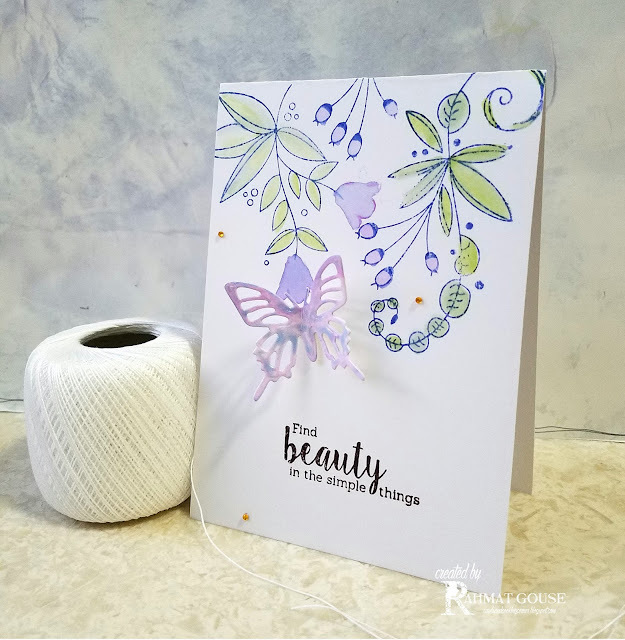 The butterfly die is die cut from a water colored left over panel. A few jewels, and the sentiment from the same set to finish off this card. I had colored the images. Its a pretty card ! Its must be an amazing experience to meet a friend in person that to after a long time ! Its always wonderful to catch up with old friends, isn't it! I love your card, Rahmat! Very pretty colors, and butterfly! Beautiful card! The images are so soft and pretty and your coloring is fabulous. Thanks so much for joining us at Just Add Ink and The Flower Challenge. Such a beautifully coloured image, Rahmat. I love the delicate details on your card; just beautiful. Thanks for playing along with us at Just Add Ink this week! So very happy to see you here Rahmat and your card is just gorgeous!! Love the shades of purple/violet and your design has such a soft, dreamy effect. Thank you so much for joining us at The Flower Challenge!! Oh, this is beautiful! Thanks for joining us at Little Tangles!